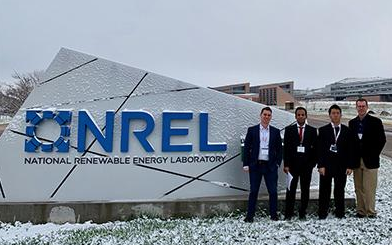 A Georgia Tech team won first place for its net-zero energy, urban single-family home at the 2019 Solar Decathlon Design Challenge at NREL! Partnered with the Grove Park Foundation and Atlanta Habitat for Humanity to make it affordable. The Georgia Tech team was led by Tyler Pilet, Ph.D. in Architecture student with a focus area in high performance building (HPB). “Our team designed a community-driven, low cost, net-zero home in Grove Park,” said Pilet. Read more. 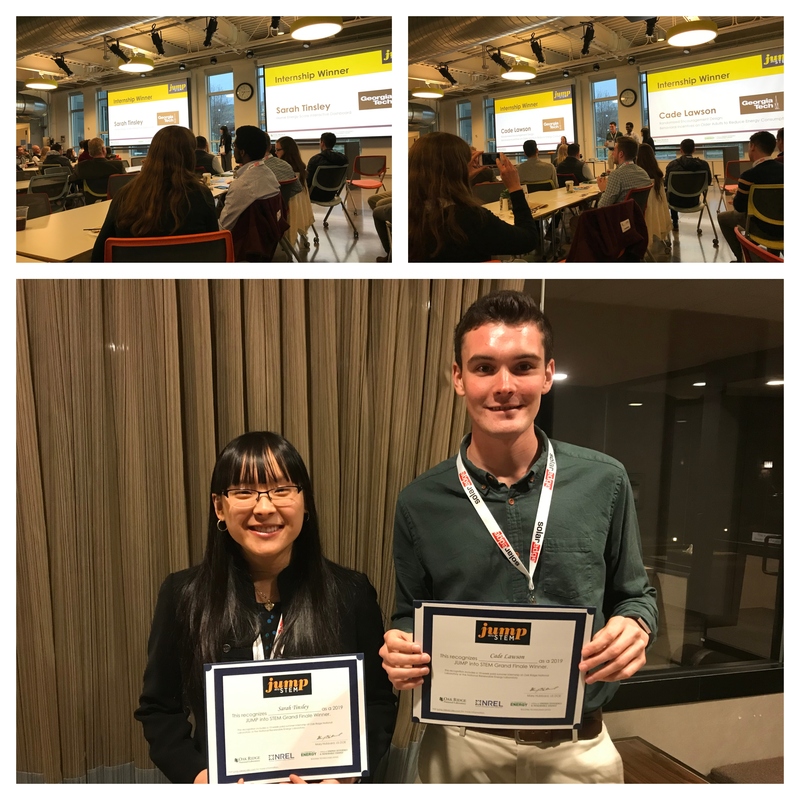 Two of Dr. Asensio's undergraduate data science and public policy (PUBP 4803) students, Cade Lawson and Sarah Tinsley, were named as winners of the JUMP into STEM national competition in Golden, CO for their projects on Smart/Connected communities and building energy performance, sponsored by the U.S. DOE/Oak Ridge National Lab. Majid Ahmadi won the people's choice award at the IISP Cybersecurity Demo Day on April 12, 2018! Congratulations Majid! Aline and Andrew both won at the Career, Research and Innovation Development Conference (CRIDC) poster competition! Aline won the tier one sponsor award from Vantiv! She presented on her Rwanda case study research! Way to go Aline and Andrew! Majid Ahmadi has been awarded a Georgia Tech 2018 Climate Change Fellowship. This fellowship fosters interdisciplinary learning communities by bringing together diverse stakeholders from on- and off-campus that meet to examine key themes related to sustainable community-building. Majid was selected from a large pool of graduate student candidates for SLS Fellows. 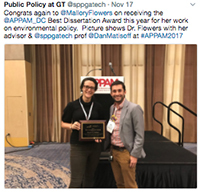 Congratulations to Mallory Flowers on receiving the APPAM Best Dissertation Award 2017 for her work on environmental policy! 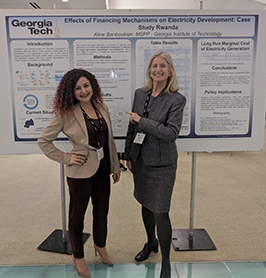 CEPL grad student, Aline Banboukian, was a finalist in the poster competition at the 2017 C3E Women in Clean Energy Symposium held at MIT, November 15-16: great chance to meet movers and shakers in the energy field. Yeong-Jae Kim participated in the 9th ETH PhD Academy on Sustainability and Technology on the topic: "Innovation for Sustainability - The Role of Technologies, Organizations and Institutions", which took place from June 17 to June 22, 2016. In total 15 PhD students from 12 countries were selected to participate. Yeong-Jae presented a research paper on "Clean disruption of lighting technologies" and received indepth feedback from the academy's faculty which consisted of Dr. Andrew Van de Ven, Dr. Desiree Pacheco, Dr. Jessika Trancik, and Dr. Volker Hoffmann, as well as from the fellow participants. The effort for preparing and attending the PhD-Academy is set at 90 hours, which is equivalent to 3 ECTS credit points. Yeong-Jae contributed greatly to the success of the academy by displaying academic originality and a supportive attitude. We wish all participants good luck with their PhD theses and future research. At the SPP Spring 2016 Awards Banquet, Alex Smith was awarded the William H. Read Award: honoring a student that is outstanding in all aspects of activities in our school: academics, leadership and progress. Congratulations to Usayd and his fellow team members, who won the NASPAA Climate Change Competition for the Southeast region and first runner-up Worldwide! They used the EN-Roads climate change scenario simulator, negotiated with various sectors to reduce emissions and minimize global warming impacts. It involved creating policy memos, SWOT Analysis, Organization Charts for G-20 Secretariat, and other materials and synthesizing everything into a final presentation. Jenna McGrath was a poster finalist at the Fourth Annual C3E Women in Clean Energy Symposium, held at MIT in November, 2015. Her poster asked "Can Hydraulic Fracking Reduce the Cost of Enhanced Geothermal Systems?" 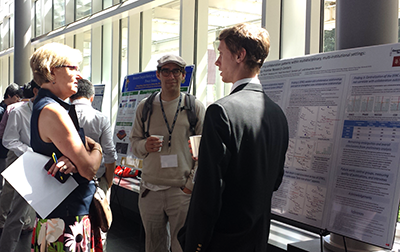 Caroline Golin and Matt Cox won the MIT poster competition last week at the C3E Women in Clean Energy Symposium at MIT. 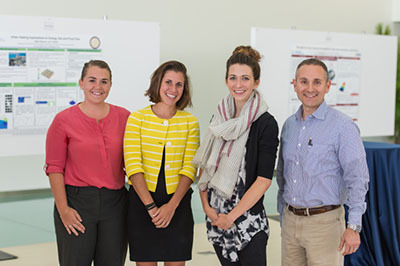 Their poster focused on FORESEE, a model that analyzes the utility economics of solar energy and energy efficiency programs, including their contribution to water conservation. The poster focused on the Atlanta metropolitan area as a case study. Congratulations Caroline and Matt! Mallory Flowers was also a finalist with an excellent poster on LEED designated buildings. Each spring, the School of Public Policy at Georgia Tech presents the William H. Read Award to a Public Policy student who has demonstrated outstanding leadership and initiative. William H. Read, Esq., was the Southern Bell Professor of Communications Policy and Chair of the School of Public Policy at Georgia Tech. Professor Read was instrumental in advancing major telecommunications legislation in Georgia. His career exemplified leadership and engagement in public policymaking. 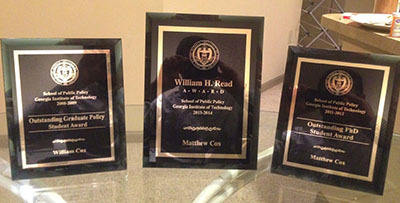 This year the Read Award went to Matt Cox. Xiaojing Sun is selected to participate in the 2013-14 New Generation China Scholars Program, at the University of Chicago Center in Beijing, supported by the Ford Foundation. Xiaojing was selected from a group of global candidates. The fellowship opportunity will allow her to conduct research on the development of the solar energy industry in China. Her research findings will be presented at a capstone colloquium in late May, 2014 in China. Yu Wang was awarded "2013 Outstanding PhD Student in the School of Public Policy." In awarding the prize to Yu, Marilyn Brown emphasized her high level of productivity. "It has been said that the key to success in today's job market is for graduate students to publish as though they were Assistant Professors, and Yu Wang is doing just that." In the past year, Yu finished the analysis of energy-efficiency potential, a project sponsored by the Eastern Interconnection State Planning Council (EISPC). She presented the findings in a conference and co-authored a 98-pages report documenting the results. A paper summarizing the research is currently under review with Yu's name as the first author. At the same time, she is the co-author with Dr. Knox-Hayes, Dr. Brown, and Dr. Sovacool on a paper which will soon be published in an issue of Global Environmental Change. Her book prospectus, drawing on her dissertation and co-authored with Dr. Brown, has been accepted by Praeger. Yu Wang's outstanding academic performance makes her a role model for female graduate students in the School of Public Policy. On April 17th Gyungwon Kim was selected for the Level II Linda Latham Scholarship, chosen from among 80 applicants. As the "Level II Linda Latham Scholar" Gyungwon will be able to attend the 2013 ACEEE Summer Study on Energy Efficiency in Industry, held July 23-26 in Niagara Falls, NY. CEPL member Xiaojing Sun was awarded Anne Robinson Clough Conference Grant for her conference appearance at the 54th International Studies Association (ISA) Annual Convention. She is one of the two recipients of the grant. With the support of the grant, Xiaojing traveled to San Francisco between April 2nd-6th to present her research of the development of the solar energy industry in China. In addition to presenting her research, she was also among a selected group of scholars who were invited to participate in ISA's International Political Economy (IPE) on Resources working group meeting, where she discussed the latest applications of IPE to research associated with natural resources. The 2011 ACEEE Student Scholarship Winner is Benjamin Deitchman. The 2011 Student Scholarship program was sponsored by the American Council for an Energy-Efficient Economy (ACEEE) and its Ally Program member Tennessee Valley Authority (TVA). The program awarded a travel grant to Benjamin Deitchman, enabling him to give a paper at the 2011 Summer Study on Energy Efficiency in Industry, in Niagra Falls. Benjamin Deitchman also won the 2011 William H. Read Award for outstanding graduate student at the Georgia Tech School of Public Policy, and was Founding President of the Public Policy Graduate Students Association from 2010-2012. Matt Cox won the Outstanding Student Award for Master's students in the 08-09 year, and the "Outstanding PhD Student" award in 2011-2012. Joy Wang has been awarded the U.S. Environmental Protection Agency’s STAR (EPA STAR) graduate fellowship. The fellowship supports environmental graduate research, providing up to three years of support for doctoral students. The EPA STAR fellowship will support Joy’s research on the impact of information, like that provided by smart meters, on consumer behavior and energy use. First, a meta-analysis will be conducted regarding the current program results and implementation methods of various smart metering initiatives throughout the nation. Next, the results of the analysis will be inputted into the National Energy Modeling System (NEMS) to examine the impact of a national smart metering scenario. Her project will add to the improved understanding of residential energy efficiency and behavioral change. Early in the Fall 2012 semester, Alexander M. Smith earned a fellowship appointment from the Georgia Tech NESAC IGERT chaired by Dr. Elsa Reichmanis. IGERT, the Integrative Graduate Education and Research Traineeship, is a program funded by the National Science Foundation that supports cutting-edge interdisciplinary research and learning programs. The IGERT program supports Georgia Tech's Nanostructured Materials for Energy Storage and Conversion program (NESAC), which provides doctoral students with superior training in multiple disciplines that are essential to conducting research in energy science, technology, and policy. NESAC IGERT fellowship appointments provide a $30,000 annual stipend and a tuition waiver. Further information about the NESAC IGERT can be found at nesac.gatech.edu. In the summer of 2012, Shan Zhou was an intern at the STIP program (Program in Science, Technology and Innovative Policy) of Georgia Institute of Technology. She applied input and output model to examine the economic impacts of the industrial and infrastructure development of smart grid in Georgia, and examined how to best position energy policies for long-term economic growth. Upon her admission into the Georgia Institute of Technology PhD Program in Public Policy, Shan Zhou was awarded with the Dean's Fellowship which provides four years of funding support beginning fall 2012. The Ivan Allen College Dean's Fellowship is a $30,630 annual award that is accompanied by an out-of-state tuition waiver. Yeong Jae Kim earned a $1,500 scholarship sponsored by the Southern Section of the Air and Waste Management Association (A&WMA). The A&WMA is a nonprofit organization that provides networking opportunities and education to enhance the knowledge and skills of over 8,000 environmental professionals in 65 countries. Yeong Jae attended the A&WMA Annual Meeting and Technical Conference held at the Beau Rivage in Biloxi, MS on September 12, 2012. There, he gave a lecture on evaluating the risks of industrial energy efficiency policies. Yeong Jae's latest paper on this topic is awaiting approval for publication within a peer-reviewed journal. Authors’ of the paper are Dr.Brown, Dr.Baer, Matt and Yeong Jae. Read a summary of Yeong Jae's latest research. A Successful School Year for CEPL Students! And looking towards continued achievements for 2012-2013! The graduate students in the Clean Energy Policy Laboratory (CEPL) in the School of Public Policy at Georgia Tech had notable accomplishments throughout the 2011-2012 academic year. Shan Zhou and Alexander Smith will both receive their Masters of Science Degree in Public Policy this Spring, and both will join the doctoral program in the fall. 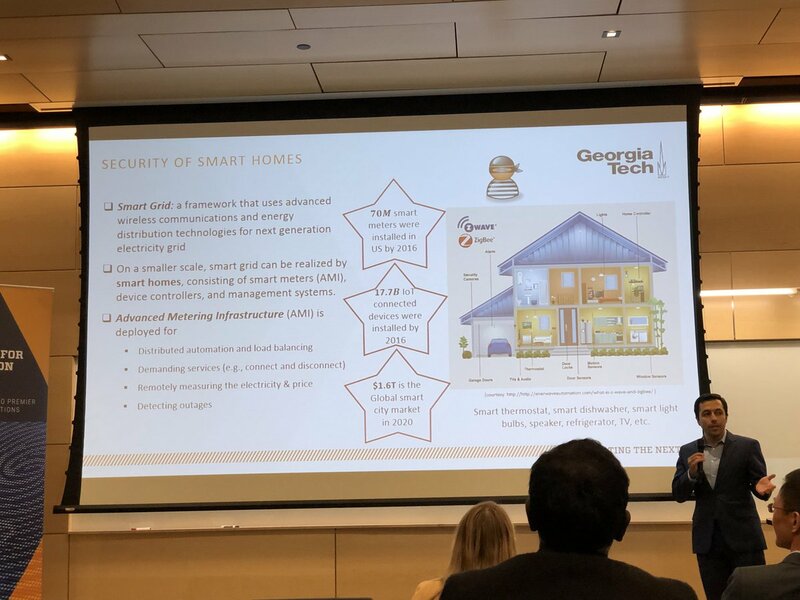 Ms. Zhou will spend the summer as a Georgia Innovation Intern at the Enterprise Innovation Institute studying the Smart Grid in Georgia, while Mr. Smith will be working at Oak Ridge National Laboratory this summer as a Grid Innovation Leadership Fellow. At the School of Public Policy Awards Ceremony in April, Matt Cox earned the Doctoral Student of the Year Award for his long record of achievement in the program. In addition to expanding his impressive publication record this year, Mr. Cox is among 6 doctoral students in CEPL who completed their comprehensive examination requirements and moved on to the dissertation phase of their academic career this year. The other students are Gyungwon Kim, Xiaojing Sun, Joy Wang, Yu Wang, and Benjamin Deitchman. In addition to a slew of upcoming dissertation proposals and defenses, the 2012-2013 school year already promises to boast further achievements for CEPL students. Xiaojing Sun and Matt Cox have had a paper, authored with CEPL Director Marilyn Brown, accepted for presentation and proceedings publication at the American Council for an Energy Efficient Economy (ACEEE) Summer Study 2012 in California. Ms. Sun and Mr. Cox, as well as Benjamin Deitchman, will present at the 2012 World Energy Engineering Congress (WEEC) in Atlanta this Fall after the Association of Energy Engineers accepted their abstract proposals. At the same conference, Dr. Brown will keynote the Women in Energy and Environmental Leadership Breakfast. Multiple student publications are also awaiting approval from peer-reviewed journals.